The inventor of cat's eyes was Percy Shaw of Boothtown, Halifax, West Yorkshire, England. When the tram-lines were removed in the nearby suburb of Ambler Thorn, he realised that he had been using the polished strips of steel to navigate at night. The name "cat's eye" comes from Shaw's inspiration for the device: the eyeshine reflecting from the eyes of a cat. In 1934, he patented his invention (patents Nos. 436,290 and 457,536), and on 15 March 1935, founded Reflecting Roadstuds Limited in Halifax to manufacture the items. The name Catseye is their trademark. 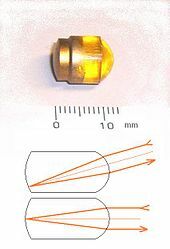 The reflective lens had been invented six years earlier for use in advertising signs by Richard Hollins Murray, an accountant from Herefordshire and, as Shaw acknowledged, they had contributed to his idea. In 2006, Catseye was voted one of Britain's top 10 design icons in the Great British Design Quest organised by the BBC and the Design Museum, a list which included Concorde, Mini, Supermarine Spitfire, K2 telephone box, World Wide Web and the AEC Routemaster bus. Solar-powered cat's eyes known as solar road studs and showing a red or amber LED to traffic, have been introduced on roads regarded as particularly dangerous at locations throughout the world. However, shortly after one such installation in Essex in the autumn of 2006 the BBC reported that the devices, which flash at an almost imperceptibly fast rate of 100 times a second, could possibly set off epileptic fits and the Highways Agency had suspended the programme. The suspension appeared to have been lifted by 2015, when LED cat's eyes began to be installed along newly re-paved sections of the A1 and A1(M) in County Durham and Tyne and Wear. Flashing blue LED cat's eyes were demonstrated on the TV show Accident Black Spot, aired on Channel 4 on 19 December 2000, which alert the driver to potential ice on the road when a low enough temperature, provisionally set at 3 °C (37 °F), is reached. Proposed enhancements in 2013 were to change the standard white light to amber for four seconds after the passing of a vehicle, or red if the following vehicle is too close or traffic ahead is stationary. Botts' dots (research started 1953, compulsory in California from 1966) and other raised carriageway markers perform a similar function in areas of the United States that receive little snowfall. In areas of the US receiving substantial accumulating snowfall that requires the use of snow removal equipment, recessed markers or those encased in protective metal are frequently used. In New Zealand, roads are generally marked with both Bott's dots and cat's eyes (generally there is one cat's eye followed by three Bott's dots places in every ten metre stretch of highway). The colour pattern on New Zealand roads is white or yellow cat's eyes along the centre of the road (yellow indicating overtaking is not permitted) and red dots along the hard shoulder or left edge of a motorway. Single blue cat's eyes are used to indicate the location of fire hydrants, and green cat's eyes are used to mark the edge of culverts. In rural settings and along State Highways, these markings are augmented by retro reflective posts along the edge of the road (white reflectors on the left, yellow reflectors on the right). Bridges are similarly marked with retro reflective markings in diagonal bands of white and black (to the left) and yellow and black (to the right). In Lebanon, cat's eyes are widely used on most freeways, highways and roadways. On freeways and highways, every one (or sometimes two) white stripes separating lanes is followed by a white shining cat's eye. On the edge of the road next to the median strip, a yellow cat's eye is placed every 10 metres. On the road shoulders a red shining cat's eye is placed every 10 metres. On roadways separated by double yellow lines, a yellow cat's eye is placed inside the double yellow lines every 10 metres. 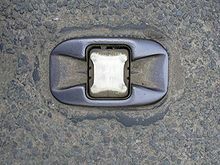 Before speed bumps, a series of cat's eyes are placed shining white to the oncoming traffic and red to the car from the opposite direction. On pedestrian crossings, blue shining cat's eyes are placed after every zebra line. On roads with traffic lights, a series of red shining cat's eyes are placed 50 metres before traffic lights to make drivers slow down. In the morning of 25 April 1999 on the M3 motorway in Hampshire, England, a van dislodged the steel body of a cat's eye which flew through the windscreen of a following car and hit a passenger (the drum and bass DJ known as Kemistry) in the face, killing her instantly. The coroner recorded a verdict of accidental death. Investigators acknowledged that the cat's eye bodies occasionally came loose, but added that such an accident was previously unheard of. A question was asked in the House of Lords about the safety of cat's eyes in light of the incident, and the Highways Agency conducted an investigation into the "long-term integrity and performance" of various types of road stud. ^ a b "The day Percy saw the light!". Halifax Today. Archived from the original on 12 March 2004. Retrieved 24 April 2013. ^ "History". Reflecting Roadstuds Ltd. Archived from the original on 19 February 2009. Retrieved 24 April 2013. ^ Reyburn, Ross (26 June 1999). "The Birmingham Post": 50. ^ "Case studies". Astucia Traffic Safety Systems. Retrieved 13 October 2009. ^ "Cats eyes to improve safety on A65, North Yorkshire". Government News Network. 6 November 2006. Archived from the original on 30 September 2007. Retrieved 15 March 2008. ^ "New cat's eye 'could trigger fit'". BBC News. BBC. 2 January 2007. Retrieved 15 March 2008. ^ Osborne, Alistair (1 April 2002). "Intelligent cat's eye gleams at bright market prospects ahead". The Daily Telegraph. Archived from the original on 11 September 2009. Retrieved 24 April 2013. ^ "Pavement Markers" (PDF). Virginia Department of Transportation. Archived from the original (PDF) on 8 April 2008. Retrieved 15 March 2008. ^ "Marking the edge of the road with markers and cat’s eyes", New Zealand Driving Test Resources. Retrieved 17 August 2017. ^ "Kemistry". Fuller Up, the Dead Musician Directory. Retrieved 2 December 2008. ^ "Cat's eye killed DJ". News of the World. 2 May 1999. p. 15. David Lydford, of Hampshire Police, said: Cat's eyes sometimes work loose, but I have never come across an accident like this in my 28 years with the police. ^ "Parliamentary Business - Cat's Eyes safety inspections". Parliamentary Debates (Hansard). House of Lords. 13 December 1999. col. WA20. This page is based on the Wikipedia article Cat's eye (road); it is used under the Creative Commons Attribution-ShareAlike 3.0 Unported License (CC-BY-SA). You may redistribute it, verbatim or modified, providing that you comply with the terms of the CC-BY-SA.